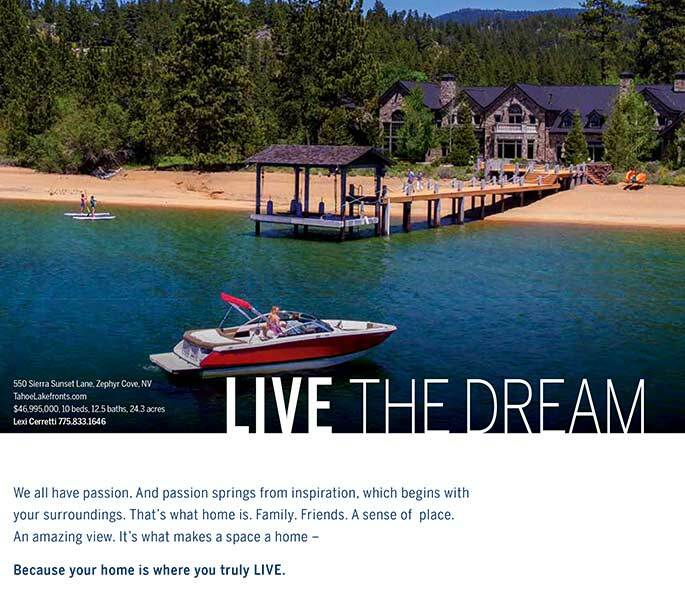 Winter at Lake Tahoe brings endless opportunities for outdoor fun. From skiing and snowshoeing to sledding and snowman making, the options go on and on. And our four-legged friends love to play in the snow with us. But when venturing into the backcountry this winter with your beloved pooch, it’s important to have a plan for how to prevent and respond to injuries and other potential emergencies your four-legged friend might suffer. Before heading outdoors, there are simple things you can do to ensure that your dog’s winter adventure will be both fun and safe. Putting booties on your dog will protect his paws from sharp ice and rocks, painful ice buildup, and dangerous salt and de-icing chemicals that he’ll want to lick off (make sure to get your dog used to the booties before setting out). 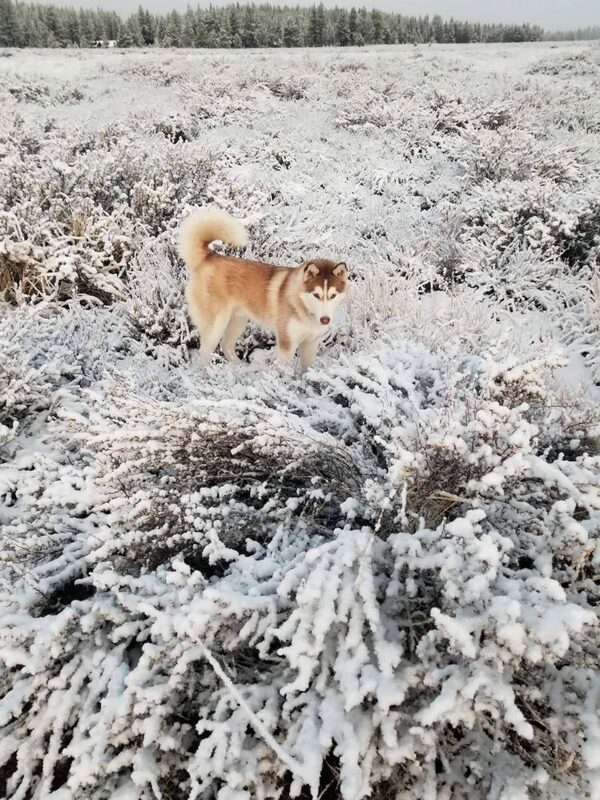 While you should avoid shaving your dog all the way down to her skin in winter — she’ll need that fur to protect herself from the bitter cold — consider carefully trimming any long hair between your dog’s pads and toes so that the hair is flush with the foot’s surface to keep uncomfortable ice balls from building up. And just as you wouldn’t head outdoors in winter without the proper clothing, neither should your dog. Put a warm coat or sweater on small, short-haired or other delicate dogs to protect them from cold temperatures and harsh conditions. We asked local animal-health experts to weigh in on how else to prevent and treat winter pet emergencies while enjoying backcountry outings with your dog. Dr. Twylah Sperka from Truckee’s Sierra Pet Clinic stressed the need to keep your dog’s energy levels high when the temperature drops. “Something to keep in mind when taking dogs into the backcountry in the winter is the extra energy they exert in moving through the snow,” Dr. Sperka explained. 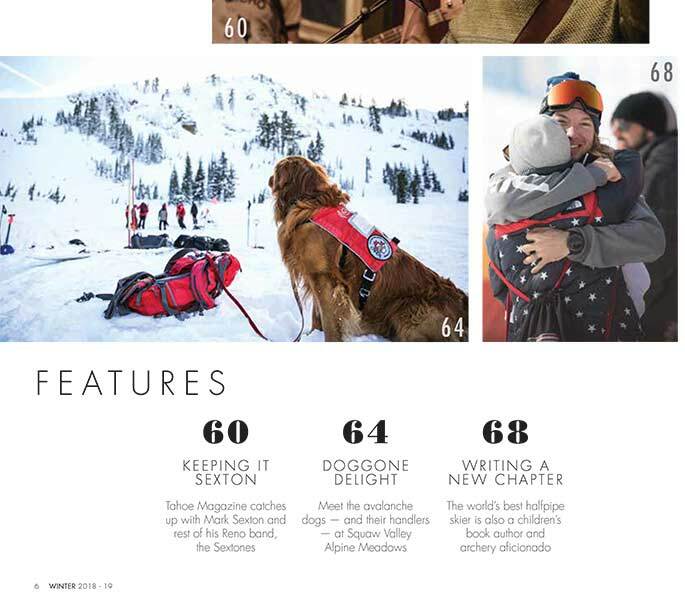 “It’s fairly easy for us to get around on skis, boards and snowshoes, so it’s easy to overlook how much harder our furry friends have to work to keep up with us, compared to when we take them on a nice summer hike. Dr. Sperka also advised working to gradually improve your dog’s endurance before taking him out for long or strenuous winter activities. “It’s a good idea to begin the season’s outdoor excursions slowly and build up to longer and longer forays into the wilderness,” she advised. “This will not only give you an idea of what your dog can handle physically but will also help acclimate them to the cold and extra exertion of traveling in the backcountry. 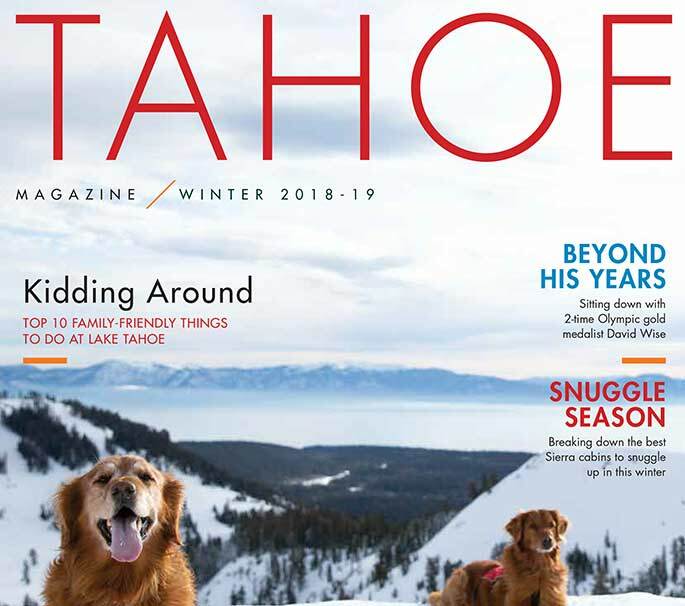 Dr. Lindsay Sjolin from Alpine Animal Hospital in South Lake Tahoe stressed the need to plan ahead for potential pet emergencies in the outdoors. Dr. Sjolin emphasized that keeping track of where your dog wanders is especially important in the winter. “Watch where dogs are walking because snow can give way easily over waterways, cliffs and depressions,” she cautioned. As is the case with summer hiking, Dr. Sjolin also recommended carrying fresh water to keep your four-legged trail buddy hydrated. 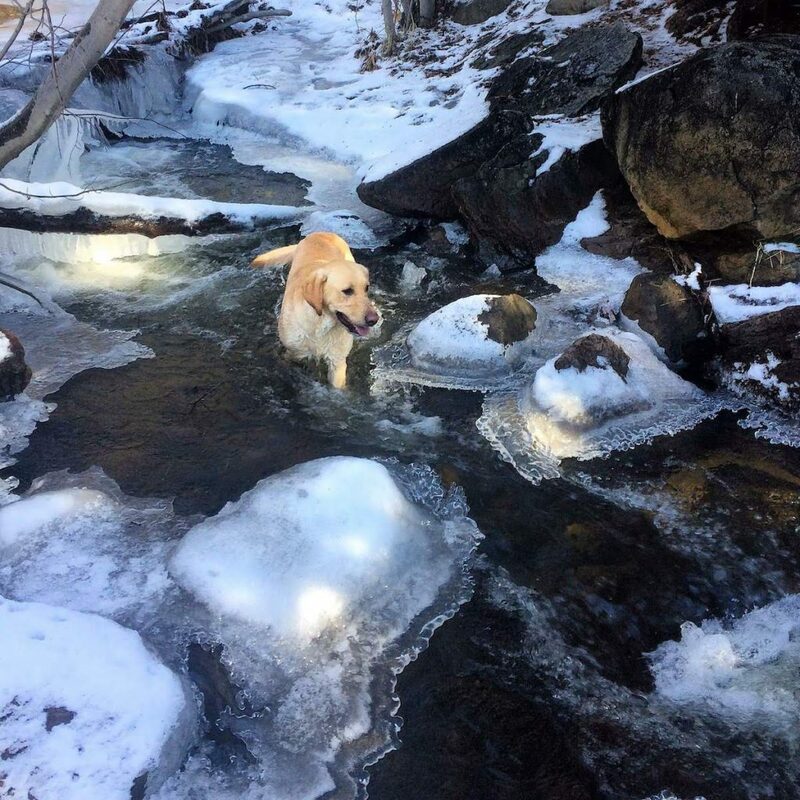 However you choose to enjoy winter Tahoe adventures with your four-legged friend, having a plan to deal with potential emergencies can ensure a fun backcountry experience for both of you.